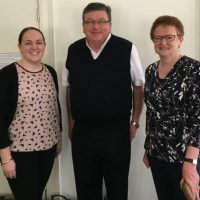 Newly appointed staff of the Australian Catholic Bishops Conference, Andrea Dean and Rachelle Smith, discussed details of the leadership program when they met with Bishop Michael McCarthy in Sydney recently. The two year program, a blend of online learning and residential experiences, is a project of the Australian Catholic Bishops Conference in partnership with Catholic Mission and Australian Catholic University to cultivate future women leaders. Bishop McCarthy is enthusiastic about the Office for the Participation of Women being fully operational again following a period of part-time support. “The ACBC is aware of the challenges that confront the Church at this time,” he said. Andrea Dean was appointed Director of the Office for the Participation of Women and Office for Lay Pastoral Ministry in August. “Having a background in formation and leadership, I am 100% committed to developing and making space for women leaders in Church and society,” she said. Upon completion, the participants will receive a Graduate Certificate in Theology from ACU. Accommodation, travel and tuition are subsidised to encourage national enrolments. Participants contribute to a portion of the overall costs. Applications will be accepted until November 26, 2017 with the program commencing February, 2018. For further information contact Andrea Dean director.opw@catholic.org.au or 0487388873. This entry was posted in Uncategorized on October 24, 2017 by ACBC Communications.